Explain how the energy and amplitude of an electromagnetic wave are related. Anyone who has used a microwave oven knows there is energy in electromagnetic waves. Sometimes this energy is obvious, such as in the warmth of the summer sun. Other times it is subtle, such as the unfelt energy of gamma rays, which can destroy living cells. Electromagnetic waves can bring energy into a system by virtue of their electric and magnetic fields. These fields can exert forces and move charges in the system and, thus, do work on them. If the frequency of the electromagnetic wave is the same as the natural frequencies of the system (such as microwaves at the resonant frequency of water molecules), the transfer of energy is much more efficient. The behavior of electromagnetic radiation clearly exhibits wave characteristics. But we shall find in later modules that at high frequencies, electromagnetic radiation also exhibits particle characteristics. These particle characteristics will be used to explain more of the properties of the electromagnetic spectrum and to introduce the formal study of modern physics. Another startling discovery of modern physics is that particles, such as electrons and protons, exhibit wave characteristics. This simultaneous sharing of wave and particle properties for all submicroscopic entities is one of the great symmetries in nature. Figure 1. Energy carried by a wave is proportional to its amplitude squared. 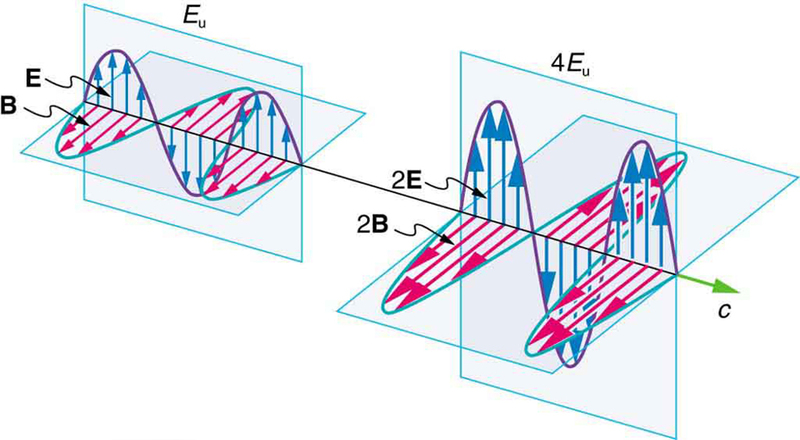 With electromagnetic waves, larger E-fields and B-fields exert larger forces and can do more work. But there is energy in an electromagnetic wave, whether it is absorbed or not. Once created, the fields carry energy away from a source. If absorbed, the field strengths are diminished and anything left travels on. Clearly, the larger the strength of the electric and magnetic fields, the more work they can do and the greater the energy the electromagnetic wave carries. where is the speed of light, is the permittivity of free space, and is the maximum electric field strength; intensity, as always, is power per unit area (here in ). where is the maximum magnetic field strength. Whichever of the three preceding equations is most convenient can be used, since they are really just different versions of the same principle: Energy in a wave is related to amplitude squared. Furthermore, since these equations are based on the assumption that the electromagnetic waves are sinusoidal, peak intensity is twice the average; that is, . On its highest power setting, a certain microwave oven projects 1.00 kW of microwaves onto a 30.0 by 40.0 cm area. (a) What is the intensity in ? (b) Calculate the peak electric field strength in these waves. (c) What is the peak magnetic field strength ? In part (a), we can find intensity from its definition as power per unit area. Once the intensity is known, we can use the equations below to find the field strengths asked for in parts (b) and (c). 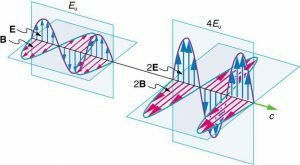 As before, a relatively strong electric field is accompanied by a relatively weak magnetic field in an electromagnetic wave, since , and is a large number. where is the average intensity in , and is the maximum electric field strength of a continuous sinusoidal wave. The three expressions for are all equivalent. 1: What is the intensity of an electromagnetic wave with a peak electric field strength of 125 V/m? 2: Find the intensity of an electromagnetic wave having a peak magnetic field strength of . 3: Assume the helium-neon lasers commonly used in student physics laboratories have power outputs of 0.250 mW. (a) If such a laser beam is projected onto a circular spot 1.00 mm in diameter, what is its intensity? (b) Find the peak magnetic field strength. (c) Find the peak electric field strength. 4: An AM radio transmitter broadcasts 50.0 kW of power uniformly in all directions. (a) Assuming all of the radio waves that strike the ground are completely absorbed, and that there is no absorption by the atmosphere or other objects, what is the intensity 30.0 km away? (Hint: Half the power will be spread over the area of a hemisphere.) (b) What is the maximum electric field strength at this distance? 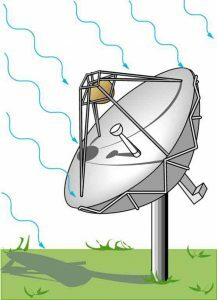 6: A 2.50-m-diameter university communications satellite dish receives TV signals that have a maximum electric field strength (for one channel) of . (See Figure 2.) (a) What is the intensity of this wave? (b) What is the power received by the antenna? (c) If the orbiting satellite broadcasts uniformly over an area of (a large fraction of North America), how much power does it radiate? Figure 2. 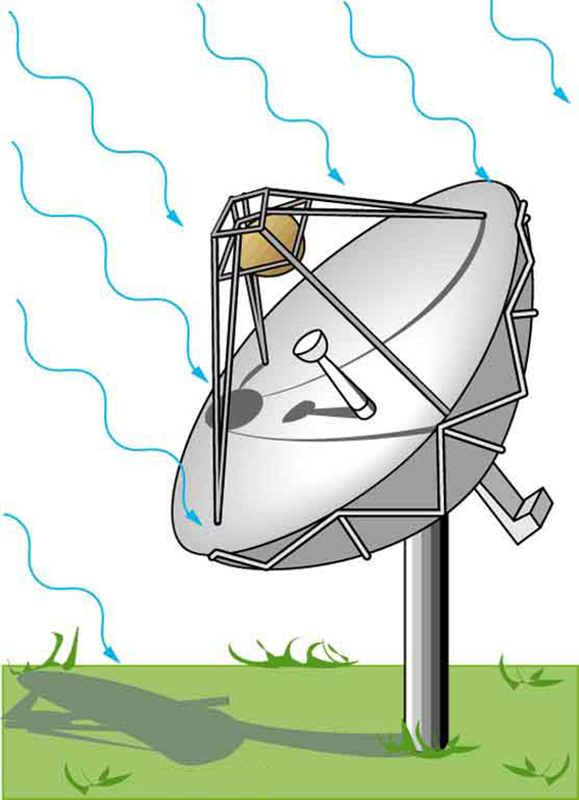 Satellite dishes receive TV signals sent from orbit. Although the signals are quite weak, the receiver can detect them by being tuned to resonate at their frequency. 7: Lasers can be constructed that produce an extremely high intensity electromagnetic wave for a brief time—called pulsed lasers. They are used to ignite nuclear fusion, for example. Such a laser may produce an electromagnetic wave with a maximum electric field strength of for a time of 1.00 ns. (a) What is the maximum magnetic field strength in the wave? (b) What is the intensity of the beam? (c) What energy does it deliver on a area? 8: Show that for a continuous sinusoidal electromagnetic wave, the peak intensity is twice the average intensity ( ), using either the fact that , or , where rms means average (actually root mean square, a type of average). 9: Suppose a source of electromagnetic waves radiates uniformly in all directions in empty space where there are no absorption or interference effects. (a) Show that the intensity is inversely proportional to , the distance from the source squared. (b) Show that the magnitudes of the electric and magnetic fields are inversely proportional to . An circuit with a 5.00-pF capacitor oscillates in such a manner as to radiate at a wavelength of 3.30 m. (a) What is the resonant frequency? (b) What inductance is in series with the capacitor? What capacitance is needed in series with an inductor to form a circuit that radiates a wavelength of 196 m? Assume the mostly infrared radiation from a heat lamp acts like a continuous wave with wavelength . (a) If the lamp’s 200-W output is focused on a person’s shoulder, over a circular area 25.0 cm in diameter, what is the intensity in ? (b) What is the peak electric field strength? (c) Find the peak magnetic field strength. (d) How long will it take to increase the temperature of the 4.00-kg shoulder by , assuming no other heat transfer and given that its specific heat is ? On its highest power setting, a microwave oven increases the temperature of 0.400 kg of spaghetti by in 120 s. (a) What was the rate of power absorption by the spaghetti, given that its specific heat is ? (b) Find the average intensity of the microwaves, given that they are absorbed over a circular area 20.0 cm in diameter. (c) What is the peak electric field strength of the microwave? (d) What is its peak magnetic field strength? Electromagnetic radiation from a 5.00-mW laser is concentrated on a area. (a) What is the intensity in ? (b) Suppose a 2.00-nC static charge is in the beam. What is the maximum electric force it experiences? (c) If the static charge moves at 400 m/s, what maximum magnetic force can it feel? A 200-turn flat coil of wire 30.0 cm in diameter acts as an antenna for FM radio at a frequency of 100 MHz. The magnetic field of the incoming electromagnetic wave is perpendicular to the coil and has a maximum strength of . (a) What power is incident on the coil? (b) What average emf is induced in the coil over one-fourth of a cycle? (c) If the radio receiver has an inductance of , what capacitance must it have to resonate at 100 MHz? If electric and magnetic field strengths vary sinusoidally in time, being zero at , then and . Let here. (a) When are the field strengths first zero? (b) When do they reach their most negative value? (c) How much time is needed for them to complete one cycle? A researcher measures the wavelength of a 1.20-GHz electromagnetic wave to be 0.500 m. (a) Calculate the speed at which this wave propagates. (b) What is unreasonable about this result? (c) Which assumptions are unreasonable or inconsistent? The peak magnetic field strength in a residential microwave oven is . (a) What is the intensity of the microwave? (b) What is unreasonable about this result? (c) What is wrong about the premise? An circuit containing a 2.00-H inductor oscillates at such a frequency that it radiates at a 1.00-m wavelength. (a) What is the capacitance of the circuit? (b) What is unreasonable about this result? (c) Which assumptions are unreasonable or inconsistent? An circuit containing a 1.00-pF capacitor oscillates at such a frequency that it radiates at a 300-nm wavelength. (a) What is the inductance of the circuit? (b) What is unreasonable about this result? (c) Which assumptions are unreasonable or inconsistent? Consider electromagnetic fields produced by high voltage power lines. Construct a problem in which you calculate the intensity of this electromagnetic radiation in based on the measured magnetic field strength of the radiation in a home near the power lines. Assume these magnetic field strengths are known to average less than a . The intensity is small enough that it is difficult to imagine mechanisms for biological damage due to it. Discuss how much energy may be radiating from a section of power line several hundred meters long and compare this to the power likely to be carried by the lines. An idea of how much power this is can be obtained by calculating the approximate current responsible for fields at distances of tens of meters. Consider the most recent generation of residential satellite dishes that are a little less than half a meter in diameter. Construct a problem in which you calculate the power received by the dish and the maximum electric field strength of the microwave signals for a single channel received by the dish. Among the things to be considered are the power broadcast by the satellite and the area over which the power is spread, as well as the area of the receiving dish. (b) Much too great for an oven. (c) The assumed magnetic field is unreasonably large. (b) L is much too small. (c) The wavelength is unreasonably small. 24.4 Energy in Electromagnetic Waves by OpenStax is licensed under a Creative Commons Attribution 4.0 International License, except where otherwise noted.